This post is about the Ilokano and Tagalog ideas of ‘receiving’, or ‘pang-ngawat’ and ‘pagtanggap’, respectively. I start with a context in FMA training and conclude with possible applications in life. My point is that learning ‘pang-ngawat’ or ‘pagtanggap’ is vital to one’s development as an FMA practitioner, in particular, for it teaches the value of resilience, in general. ‘Pang-ngawat’ keeps the Ilokano grounded in reality and ‘pagtanggap’ keeps the Tagalog grounded in their own self-belief. FMA context. There are two central training techniques in FMA: (1) copying a teacher’s moves and (2) training with a partner ‘to feed’ and ‘to receive’. Copying is the more elementary of the two for it involves no physical contact with another player. When we copy our teacher’s movements, we are at the very beginning stage of learning: we are passive consumers–neither expressing ourselves through our own natural movement, nor responding to an actual strike. While there is some degree of conceptual understanding to be achieved from copying, this training technique’s limitation is that the lesson cannot be felt, only imagined. It’s like learning a song, but singing it without feeling its full meaning. Training against another player is more advanced. Your partner reacts and completes your movement with a counter-attack that you not only feel, but also anticipate sometimes with a healthy measure of fear and always with a dose of anxiety. 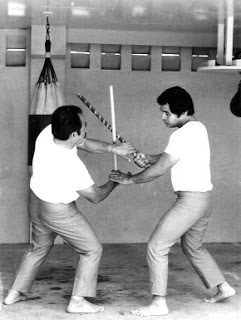 In both training techniques, most students focus on learning proper offense–how to strike at every angle in the right form, right foot work, and with the right body mechanics–leading them to master how ‘to feed’. 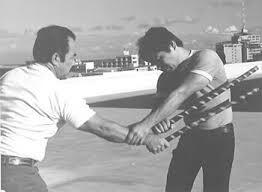 ‘To feed’ in FMA is to offer a strike at a specific angle in proper form in order to achieve two goals: to execute a strike being learned, and, more importantly, to help the recipient learn how to react to the strike. ‘To receive’ is to respond to an offensive strike: to block, to deflect, and to grab. In the continuum of feeding and receiving, most learn primarily how to be on the offensive. Most learn ‘to feed’ routinely as structured lessons; most learn ‘to receive’ via thematic seminars as advanced specialties. Most practitioners, then, primarily learn how to be hard, dismissing the lesson in being soft as conditional (learn only ‘to receive’ once I’m good enough or advanced enough). Intuitively, we know that most things that are hard full-time ultimately break under repeated stress, and that most things that flex, that absorb, bounce back. This tells us that learning how ‘to receive’ is equally important in our development as FMA practitioners. Indeed, knowing how to block well, to deflect well, and to grab well positions oneself for an effective counter-attack by developing one’s ability to sense an opponent’s true intention from feeling the direction of his/her strike. In addition, knowing how ‘to receive’ in FMA helps us conquer our own fear and anxiety, while simultaneously magnifying these in our opponent. When you can receive a blow, you strengthen yourself and demoralize your opponent by showing him that you will not break despite his repeated attacks. Counterintuitively, when you can expertly receive a strike you form a shield, thus, the common term used for it in FMA, ‘sangga’. Application in life. In Ilokano and Tagalog, the words used to mean ‘to receive’ are ‘pang-ngawat’ (pang-nga-wut) and ‘pagtanggap’ (pug-tang-gup), respectively. Understanding the depth of both terms extracts the culture-bound insight within them. Both have two primary meanings. ‘Pang-ngawat’ means both to receive and to understand; ‘pagtanggap’ means both to receive and to accept. The combination of receiving and understanding in ‘pang-ngawat’ teaches us that ‘to understand’ has an additional dimension of ‘to receive openly’. The nuance in ‘pang-ngawat’ reminds us to be present when we perceive in order that we see, feel, and hear fully. If we are to be adaptive–if our goal is to interpret our environment accurately and respond to our environment in a way that meets our personal needs optimally–we must allow as much input in. Receiving openly is key in the process of understanding. Often, because we do see the value of having good understanding, we take in such a small subset of info that it is impossible to guard against that which is incomplete or biased. One consequence is we consume only information that fits our own worldview, and we lose our natural defense against our own biases. Needless to say, if our goal is to understand, we must, therefore, remember to first ensure our perceptions reflect reality, especially in an age when our online activity enables marketers to profile us and, through our gadgets, inundate us with targeted info they think we want to consume. We must go back to the basics and take more proactive control of the data we consume and operate with so that unexamined inaccurate data do not take hold. Because we adapt to what we perceive as real, we should not construct a warped reality defined by our biases. The combination of receiving and accepting in ‘pagtanggap’ teaches us the value of finality, a necessary condition for moving on. The nuance in ‘pagtanggap’ reminds us to be accepting of what is. If we are to be adaptive, we must learn to accept the truth about the world and, more importantly, about ourselves. Accepting is a key dimension of receiving, philosophically and behaviorally. When we accept, we acknowledge what is real, what is true emotionally and cognitively, enabling us to respond to our environment in an adaptive way. ‘Pagtanggap’ is not associated with any one emotion: we are neither happy, nor sad; we just accept that it is what it is. When we deny what is real, we behave in a maladaptive way, and we don’t get our needs met because we act without acknowledging what our true needs are. We should be accepting of our true self–our weaknesses, our fears, our limitations–so that we can self-improve. Accepting oneself is key to building our own self-belief, to strengthening that which is weak, and to bettering ourselves. The Ilokano and Tagalog are resilient people. One manifestation of their resilience is their spin on martial art, escrima and arnis. Because language and the vocabulary we create in it says a lot about how and what we think about the world, examining ‘pang-ngawat’ and ‘pagtanggap’ helps us benefit from the insight of the Ilokano and Tagalog. We learn, for example, that understanding and accepting are important dimensions of perceiving reality, or receiving it. These nuanced dimensions help us be more adaptive. In FMA, they show us the legitimate value of training ‘to receive’ not just ‘to feed’. Photo credit: Sam Buot, Sr. This entry was posted in Uncategorized and tagged arnis, escrima, filipino, filipino american, filipino martial arts, FMA by rbvergara. Bookmark the permalink.